A native plant from Central and South America, dragon fruit (Hylocereussp ) or “pitaya” is gaining its popularity in the Philippine market. The plant is adapted to tropical or arid climates with rainfall of 30-40 inch and any kind of soil with organic matter. The fruits with red or pink, leathery skin are eaten by spooning out the flesh, or in slices. Fruits can be processed to juice, ice cream or wine. The beautiful flowers, only blooming at night, are used for tea or aroma therapy. Fruits are healthy (high in vitamin C, fibers, anti-oxidants) and nutritious. It strengthens the human immune system and is used in the treatment of diabetes. Medicine made from flower and stem promotes blood circulation. Therefore, Dragon Fruit can be marketed as a prestigious “health food”. The potential of dragon fruit is bright because it commands a very high price in the local market; it costs around P120-150 per kilo. 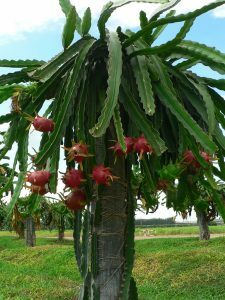 In a demo of a three-year old dragon fruit farm, it can produce 5-6 t/ha with a value of P720,000 in the local market alone. Considering its current demand, it is no wonder that dragon fruit is now dubbed as the new money crop—truly, a high revenue earner for farmers/producers. Hylocereus undatus (Pitaya blanca or White-fleshed Pitaya) has red-skinned fruit with white flesh. This is the most commonly seen “dragon fruit”. Site Selection: Dragon fruit must be planted in an open field with direct exposure to sunlight. It is not conducive to plant the crop in areas where rainfall is well distributed. Site should be free draining with a sandy loam soil with a high organic content. Ground Preparation: Rows or individual sites are mounded to 300 mm, poles should be no more than 2 m long with 600mm in the ground. Poles can be anything from concrete to PVC, (but treated timber should be avoided) with a frame attached to the top to allow the plant to hang down. The recommended planting distance is three meters between posts and four meters between rows. Proper distance of planting is important since a narrower spacing gives quicker production than larger spacing. Red flesh pitaya prefers to grow on a trellis or fence line.